Sea of Thieves Xbox One Controller Limited Edition | Nerd Much? 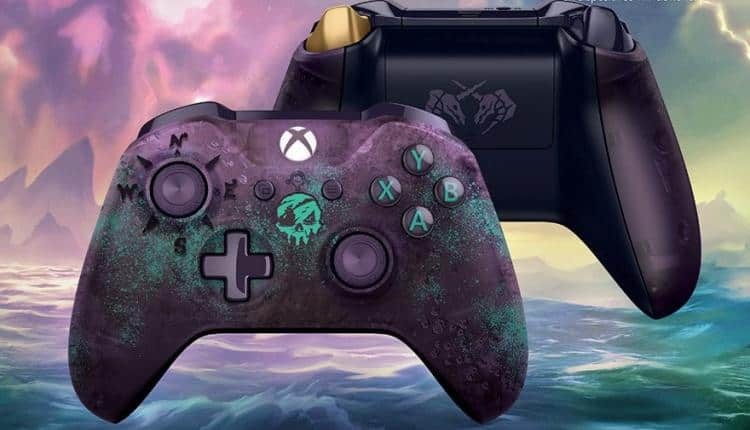 Sea of Thieves will be releasing next year (we hope) and now you can get a Sea of Thieves Xbox One Controller Limited Edition. Not only are the colors great on this controller, it has a few accents that make for clever touches in the design. Let’s start with those colors. This controller looks like it went through a spray paint job of green and purple over black. They’ve created a texture over this translucent surface that that makes it look like the beginnings of rust on the side of a car, or the beginnings of wear on a ship. Don’t worry, though, this controller isn’t rusting and the texture isn’t actually rough, save where it needs to be on the back of the grips. The clever touches include the bright green skull in the middle, both eyes are silhouettes of pirate ships, the teeth are silhouettes of pirates, and the nose is an island. The left joy-stick is a stylized compass in black, just in case you lose your way. On the back of the controller we see two undead unicorns, or perhaps a kind of sea creature, like a hippocampus. No, not a part of the brain, a hippocampus is also a creature in Greek mythology, It’s literally a sea-horse, often winged and with the bottom half converted into a large fish tail. They do not usually sport a single horn, but the sea creatures of Sea of Thieves are still unknown. My personal favorite subtle touch to this controller is the right trigger. Unlike the left one, it is pure gold. I like to think it is like the gold tooth so many stereotypes of pirates have, or simply a golden nugget – just to remind you what your motivations are in the game. While looking good and stylish, this controller has all the main features of a normal Xbox One controller. You can pre-order it now for $74.99 USD and the controller will be released February 13, 2018. I wouldn’t get your hopes up that the game will release around then, however. This game has quite the reputation for being pushed back over and over again.